Seasonal Gardening provides a month by month account of tasks that need to be done in the garden. Our free online guide is packed with hints, tips, helpful projects and useful gardening ideas for every season. Covering the whole of the UK (Great Britain, England, Scotland & Wales). Now that spring is finally here, there is so much that needs to be done in the garden. However, the most important task is to keep an eye on the weather report for late frosts and to protect vulnerable plants, blossom and tender buds. Also watch out for hot dry spells, watering plants as soon as they need it, especially container grown plants. It is time to start feeding established perennials and to make room for new growth by weeding and cleaning-up the borders. Although herbaceous plants are starting to grow away, most perennials have a long way to go to fill the borders, and some may not have even survived the winter. Fill unsightly gaps with early flowering hardy annuals such as wallflowers or plunge pots of crocus, tulips and narcissus, to fill those empty spaces. Where gaps are larger, add some early-flowering perennials, like Doronicum or Bergenia, planting them in groups of three or more. April is the ideal time to start sowing new annuals and perennials for the coming season. A wide range of vegetables can be also be sown now including, cucumbers, pumpkins, sweetcorn, aubergines, tomatoes, peppers, salsify, sorrel and chard under cover. Also Brussels, cauliflower, carrots, peas, beetroot, red cabbage, summer cabbage, leeks and turnips can be sown outside now. This is a good time of year to check-over variegated plants, shrubs and climbers, to remove any reverted shoots of solid green. Use a sharp secateurs to cut out these plain green shoots at the base or where they spring from a main branch. If left on the plant these reverted shoots can eventually dominate the growth, and gradually the whole plant may revert to solid green. Who can fail to appreciate the magnificent blooms of the Magnolia in early spring. New compact varieties, such as 'Susan' are ideal for the smaller garden or even for growing in pot on the patio. Outstanding gardens planted for aroma, colour and a wide season of interest. 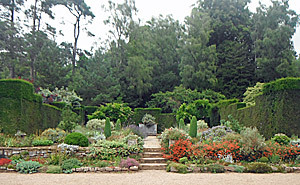 Run by the National Trust, the gardens are imaginatively planted and impeccably maintained, containing many rare trees and shrubs. 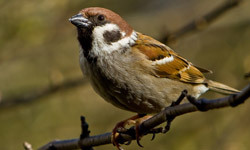 The House Sparrow likes to nest close to people and is a common sight all year round in the UK.